For any British cycling fan watching the form of Bradley Wiggins through the early months of June 2012 a strange conclusion began to present itself. It was hardly a nailed on certainty, but it began to dawn on people that he could win the Tour de France. By the time he raced the Criterium de Dauphine in June (one of the traditional warm up events for Tour contenders) he was matching the skinny climbers in the high Alp’s and sending them packing in the time trials. He dominated the Dauphine with a finely tuned strategy designed for Tour de France glory. Fast forward to the Tour in July and as those three weeks across France got better and better we watched open mouthed, excited. Wiggins rode like a man in control and behaved like’ le patron’, the elder statesman of the peloton. We loved the interviews and the press conferences. Wiggins got irritated and ranted, he did impressions and cracked jokes. In short – he behaved like many top sportsman don’t – he charmed and entertained and spoke from the heart. As he took possession of the Yellow Jersey early and carried it all the way to Paris, Wiggins seemed assured of not only the first British win in Tour de France history but of genuine national treasure status to boot. And it duly came. The documentaries, the awards, even a Knighthood. Sir Brad became immortal. But somehow the backlash began. 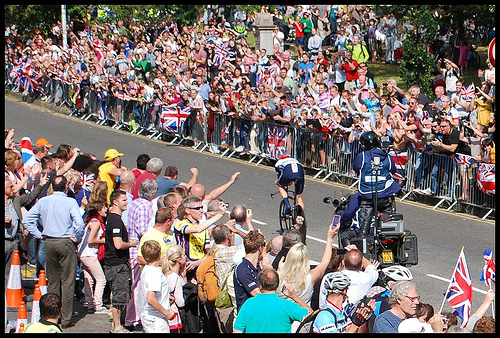 Not a full-scale-dragged-through-the-gutter-by-the-tabloids backlash, but more of a whispering campaign by cycling fans. The murmuring started in late 2012 with the TV appearances, the sharp suits, the Paul Weller collaborations – Wiggins was in full Mod mode. There’s nothing wrong with all this, he’d earned his time off, but we’ve got used to our media trained mega stars and we expect them to live like monks. Come the new year, Wiggins was low-key and out of competition. 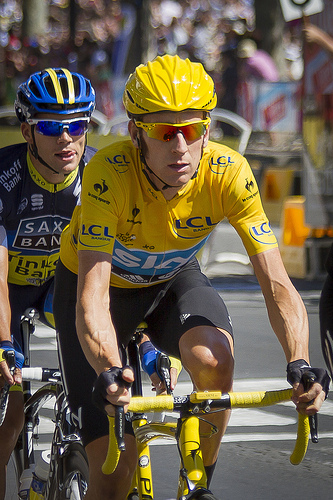 As the weeks and months of 2013 passed his heir apparent (and talented team-mate) Chris Froome was racing regularly and winning everything, reminiscent of Wiggins 2012. The young pretender Froome was being talked up for the Tour – it had the feel of a passing of the baton. Come the Giro d’Italia in May – a tough, mountainous, weather affected beast of a grand tour – Wiggins spearheaded the Team Sky challenge, still with little in the way of form. Sir Brad faltered, struck down by a debilitating chest infection and, it later transpires, a knee injury. Wiggins dropped out of the Giro after a week or so and the whispers got louder. The cynics suggested he was lacking fitness and didn’t have the heart for a race of steep climbs and snow topped finishes. The sight of Wiggins struggling to hold the wheel of a team-mate simply riding in the peloton – the Tour de France winner and Olympic time trial champion lest we forget – suggests otherwise. For a rider of his stature and ability to be struggling so badly, the sub-zero temperatures and brutal racing had clearly taken it’s toll. Wiggins was unwell. When Wiggins was declared unfit to defend his Tour de France title, and cast doubt on whether he will ever compete in the race again (citing the huge commitment and sacrifice required), this was the final straw for his detractors. It’s worth remembering that Bradley Wiggins is no one hit wonder. Following his sensational 2012 Tour win he won Olympic gold in the time trial at London, taking his medal tally to 7 (a British record). Add to this numerous other titles on both track and road, and cap it off with knighthood, and Wiggins is one of the most successful athletes these islands have ever produced (and in perhaps the toughest sport of all). Wiggins is not a man who lacks the heart for a fight. Should the 2012 Tour prove to be his last, then so be it. It was a sensational and exhilarating achievement in a memorable sporting year. Maybe some fans are a little bit broken-hearted – the high point has happened, never to be repeated – but it’s time to remember the good times and move on. If Wiggins chooses not to put himself through the mill again then surely he’s earned that right. If 2012 was the climax to Bradley Wiggins career then what a climax, and what a career. To quote the man himself: ‘not bad for a lad from Kilburn’. We’ve not seen the last of Sir Bradley. I would bet money on him winning the individual time-trial in the forthcoming World Championships in Tuscany and I’m not a woman who likes to gamble! I love your optimism Sheree, fantastic! His recent win in Poland suggests he might be coming into a bit of form – the sight of Wiggo nailing a time trial is always worth watching.